A: Make it look like a ban! Gov. Cuomo's post on Facebook today. and some of it is coming from unlikely sources. he voted for a permanent ban on fracking in the Delaware River Basin. The Delaware River Basin Commission today passed a RESOLUTION today (on which Gov. 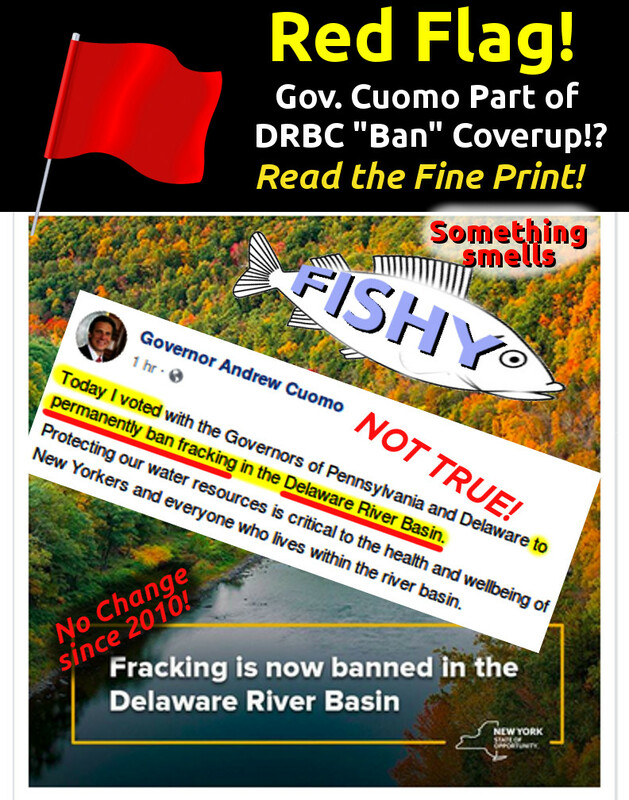 Cuomo holds a seat, along with the governors of DE, NJ, PA, and President Trump) to WRITE RULES (a "rulemaking") which would govern how fracking would occur in the basin. They pledged to TALK ABOUT language of a prohibition. They DID NOT PLEDGE to a prohibition in the entire basin. Many trusted friends in the movement are calling this a "BAN" and jumping for joy. 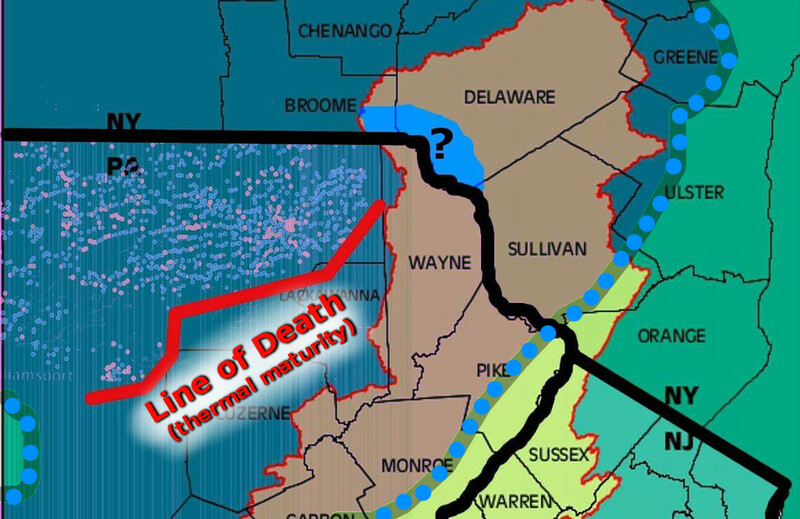 The leak on Thursday to Associated Press (which we believe came from Governor Tom Wolf's office) stated the ban would only be in TWO COUNTIES in the Upper Delaware over the Marcellus, likely Wayne and Pike County. There is NO GAS THERE! as they are South and East of Engelder's "Line of Death". Tiny Blue/Pink dots: Gas Wells. Blue Dots: Perimeter of Marcellus Shale. Light Blue: NY area with prospects? Notice the PA drilling stops before we get to the DRB (no gas in Wayne Co). So what's going on here? 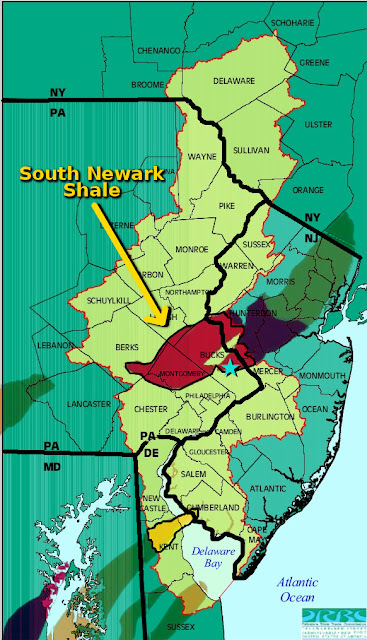 HINT: Google "South Newark Shale". In 2012, a temporary do-nothing ban(*) was enacted (5 years ago), inserted into a late-night budget bill by a couple of PA State Senators (McIlhinney and Mensch) from the wealthy PA Suburbs, seeking reelection brownie points. 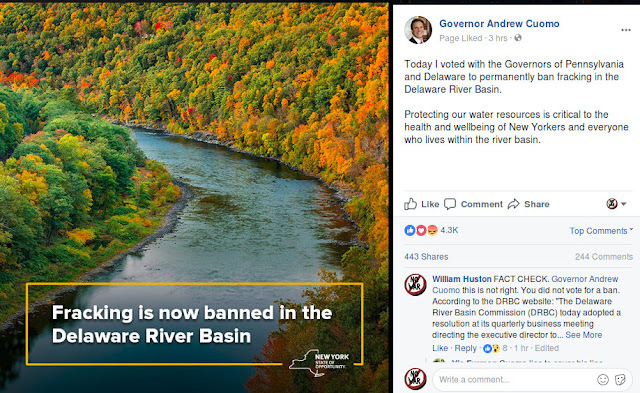 (* It was "do nothing" because fracking was already effectively banned in the entire DRBC since 2010). will expire Dec 31, 2017! WOOT WOOT -- RED ALERT. Bucks County is where the DRBC just met. Huh. where BTW there isn't any gas). And then Cuomo chimes in that he voted to "ban fracking (permanently)"
SOMETHING IS FISHY with this DRBC "Ban". Read the fine print, friends. "The Associated Press is reporting that the Delaware River Basin Commission will announce its intention to ban fracking tommorow. The plans are to ban fracking in two counties, Wayne and Pike, the only vulnerable counties in the Basin that are also in the Marcellus. In other words, it would effectively ban fracking in the entire basin." Uh, no it wouldn't. And Berks County is potentially impacted when this new shale basin is opened up. I am not trying to disparage the good work of any person. who can always be trusted 100% of the time.